Buying a Fender Champ X2 amplifier feels somewhat like buying a really nice BMW, and subsequently discovering that a hitherto unnoticed button on the dashboard activates a faster-than-light engine and a time-travel device. It’s a fabulous little amp, but you won’t believe what else it knows how to do. 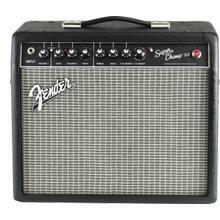 I confess to a degree of nostalgia for Fender Champ amplifiers. Most of the earlier Champs of my experience were bought second-hand – they were held together with duct tape and random wood screws, and they sounded like the ocean. The Fender Champ X2 shares little of the questionable apprehensions of its ancestors. The first salient detail of the Fender Champ X2 – and that which drew me to it amidst a sea of similar small guitar amplifiers – is that it offers authentic vacuum tube sound through the diabolically clever subterfuge of using authentic vacuum tubes. The part of the Champ X2 that drives its internal speaker is a traditional class AB tube amp, based on a 12AX7 preamp and two 6V6 drivers. It’s as warm and rich as guitar amps were back in the day, when tubes were still state of the art. Actually, the tube output section of the Fender Champ X2 would blow away tube amplifiers from half a century ago. One of the great ironies of this technology is that, long after tubes have become weird little electro-mechanical curiosities for most audio technology, the improved manufacturing techniques of the twenty-first century have made them way better than their pulsating, glowing forebears. While the Champ enjoys the enviable sound of tubes, it lacks the incessant hissing, crackling and double-digit harmonic distortion of earlier epochs. The output section of the Fender Champ X2 produces fifteen watts of power. While this would be a pretty respectable scream for a small combo amp all by itself, it’s driving what appears to be a particularly efficient speaker. Crank it up to ten and it will launch your house into low orbit. The Champ X2 is styled very much like a vintage Champ of old, with a black case, a grey speaker mesh and simple, vaguely retro controls along its front panel. There’s even a funky red power light at the far right of the panel, to let you know it’s working. There’s no duct tape anywhere on it, which took me a minute to get used to. The Fender Champ X2 is expertly crafted in Mexico, rather than having been slapped together in China, as so many of its competitors seem to be. I confess to having bought my Champ X2 based on a quarter of an hour noodling with one in a local music store, having failed to read either the fine print on the card tied to its power cord or the lucid manual that accompanies it before I beat up my credit card. Thus it was that upon returning home with it, defeating its extensive packaging and plugging it in, I discovered a whole alternate universe in there, waiting to be explored. Well you might ask, as did I, what might a guitar amplifier need with a USB port. While the loud bits of the Fender Champ X2 are as old-school and traditional as any guitar player could wish for, there’s a truly remarkable state-of-the-art sound processing section hidden amongst its tubes. It can do things with music that would have entailed an eighteen-wheel truck full of hardware a decade earlier. The front panel of the Fender Champ X2 includes the usual volume and tone controls, plus two additional and slightly mysterious knobs. The first one selects the amplifier’s voice. As it emerges from its packaging, it can emulate sixteen classic amps, including several vintage Fenders. It can also impose a variety of popular stomp-box effects on them, such as reverb, chorus, delay and so on. The standard amp emulations and effects included with the Fender Champ X2 are startlingly well executed. It’s genuinely surprising to hear a long-dead amp that hasn’t seen daylight since the moon landings rocking away in a box the size of a desktop computer. This, however, is as nothing compared to what the Champ X2 can aspire to if you connect the aforementioned USB port to a PC or a Macintosh. Download Fender’s no-cost Fuse software and your computer will be able to have a word with your amplifier. Having done so, it will be able to “deep edit” its effects. The combination of the Fender Champ X2 and Fuse defies description. You can reprogram all sixteen of its default voices, and make them do whatever you like the sound of. Select an amplifier emulation in Fuse and the software will display a graphic of the original amp. You can plug in simulated stomp boxes and rack effects, and adjust their parameters with on-screen knobs and switches that have a learning curve best measured in milliseconds. The interface is intuitive and flawless, and the sounds available from the Fender Champ X2 after it’s spent some time with Fuse are astounding. The Fuse interface can effectively run all the controls of the Champ X2 in software – you won’t even have to crouch down and fiddle its knobs by hand while you’re devising new voices for it. Having created personalized voices for the Fender Champ X2 in Fuse, they can be saved to disk for later use, and downloaded into the sixteen voices of the amplifier when you’re happy with the results. Once it’s been programmed with the voices you favor, the Champ no longer needs access to a computer – your new voices will be accessible through its front panel Voice knob. The innumerable effects available through the Fuse software, and its effortless user interface, make programming the Champ X2’s voices more fun than is probably legal in many jurisdictions. You can nuke an entire afternoon with this thing without half trying. It feels like a video game especially designed for guitar players. In addition to using its USB interface to configure the amplifier, the Champ is disposed to sending digital audio back up the wire as well. 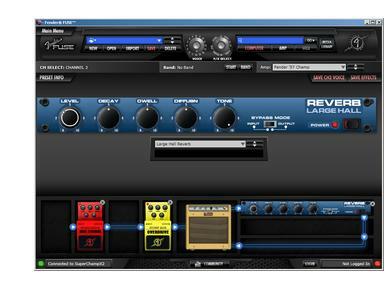 It can be a digital guitar interface to get sound into computer-based recording software. This proved to be more useful than it would initially appear, as you can jam in real time and then record precisely the same voices through the Champ’s digital interface. The Fender Champ X2 is robustly constructed, beautifully engineered and – with the adjunct of its Fuse software – inexpressibly sophisticated. Even after extensive time spent with Fuse, I doubt I’ve mastered a fraction of its capabilities. Someone put a lot of hours into this application. Like most really well-designed music toys, the Fender Champ X2 can be as simple or as involved as you want it to be. If the thought of programming your amplifier seems too much like trying to teach your cat to read tablature, you can leave the USB cable that comes with the Champ in a drawer – it’s seriously impressive right out of the box. The case of the Fender Champ X2 rests on four hard metal feet. Placed on a hard floor, the amp resonates at specific frequencies – a low G was pretty much ideal for my Champ – and makes some very strange noises. Attaching felt or rubber feet to the bottom of the amplifier disabuses it of this behavior. The Champ sports a traditional plastic carrying handle on top of its case, which as nearly as I could determine, is wholly decorative. Unless you have gorilla fingers, you probably won’t be able to muster enough strength to pry it up either. In that my Champ is never called upon to move, this was only a passing issue. Easily the most fun to have arrived here in a box all year, the Fender Champ X2 is everything I could have asked for in a small guitar amplifier, and a world of additional stuff I wouldn’t have dreamed of suggesting. It sounds brilliant, and it can be every pedal and flashing, beeping, squawking, buzzing, humming and smoking effect anyone’s ever owned and subsequently regretted giving away. If you have more space than I do, the Fender Champ X2 is also available as a head and a separate cabinet.